NAGANO (February 22, 1998) -- U.S. Olympic Team-Women's Ice Hockey Captain Cammi Granato called it the end of a perfect week. "Every Olympic athletes dream. First a gold medal and then your own Wheaties box," said Granato. Granato and her teammates took care of the gold medal on Tuesday with a victory over the Canadian Women's Ice Hockey Team. On Sunday, the makers of Wheaties, The Breakfast of Champions, made sure that the second half of her dreams came true. 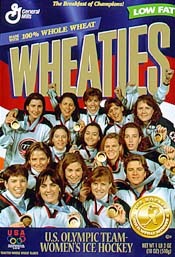 Just hours before the closing ceremonies for the 1998 Olympic Winter Games at a news conference in Nagano, Japan, Wheaties announced that the history-making U.S. Olympic Team-Women's Ice Hockey -- whose gold medal winning performance captivated and inspired Americans everywhere -- will appear on one of the most prestigious covers in American sports culture: the front of the Wheaties box. Flanked by Olympic gold medalists Dan Jansen and Bonnie Blair, who co-hosted the Wheaties announcement, the U.S. Olympic Team-Women's Ice Hockey unveiled their special edition Wheaties box before a crowd of journalists from around the world. Wheaties officials announced that the box is expected to be a collectable and will be rushed to supermarkets nationwide starting March 2. "The extraordinary women of this gold-medal winning team have set the standard for every team that will follow. Their teamwork, excellence and dedication have earned them the cover of the Wheaties box, and much more," said David Dix, Wheaties spokesperson. "This team will be remembered by everyone who watched or attended the Games. What happened here in Nagano will inspire thousands of American athletes with dreams of victories yet to come." The 1998 Olympic Winter Games are the first ever to feature Women's Hockey, and the U.S. Olympic Team-Women's Ice Hockey is the first ever to win a gold medal. "It's a dream come true to win a gold medal, but to be singled out and picked for the Wheaties box is beyond anything we ever imagined," said Alana Blahoski, a forward for the team. Wheaties has showcased Olympic champions since the 1930s when Johnny Weismuller and Babe Didrikson endorsed The Breakfast of Champions. Bob Richards, two-time Olympic pole-vaulting champion, served as the Wheaties spokesperson from 1958 to 1970. Decathlon gold medalist Bruce Jenner was on the box in the 1970s, and gymnastics champion Mary Lou Retton graced the box in the 1980s. After the 1996 Olympic Games in Atlanta, Wheaties created five different boxes featuring Amy Van Dyken, Michael Johnson, Dan O'Brien, Tom Dolan and the U.S. Women's Gymnastics Team. "It is a pleasure to see the tradition of U.S. Olympic team excellence commemorated through what has become another wonderful tradition in sport: the Wheaties cereal box," said John Krimsky, Jr., Deputy Secretary General of the United States Olympic Committee and President of Olympic Properties of the United States. "The process of reviewing all the great Olympic performances in order to select one as the most memorable and inspirational was very difficult," said Bart Reed, Wheaties marketing manager. "On behalf of General Mills and Wheaties, we would like to congratulate each and every Olympic champion." Wheaties is the 100 percent whole wheat Breakfast of Champions. It is low in fat and packed with 10 essential vitamins and minerals. Wheaties is part of the "Team Wheaties" product line, which includes Honey Frosted Wheaties and Crispy Wheaties `N Raisins. Wheaties is produced by Minneapolis-based General Mills.